ngland Women overpowered New Zealand to win the Cup Final of the Langford Sevens on Sunday, their first Series Cup title since 2013. England came through the first day disappointed, finishing second in Pool C after losing to Canada. However Simon Middleton’s side came back fighting to put in dominant displays against the USA and World Rugby HSBC Women’s Sevens Series leaders Australia to reach the final. New Zealand were first off the mark in a first half that contained no less than five tries, but it was England that lead 19-14 at the break, with two tries from Heather Fisher, who was later awarded Player of the Final. Joanne Watmore followed up her first half try with a second from a counter ruck and despite a strong battle, England's experience and fitness shone through to put the game out of New Zealand’s reach and a final score of 31-14. 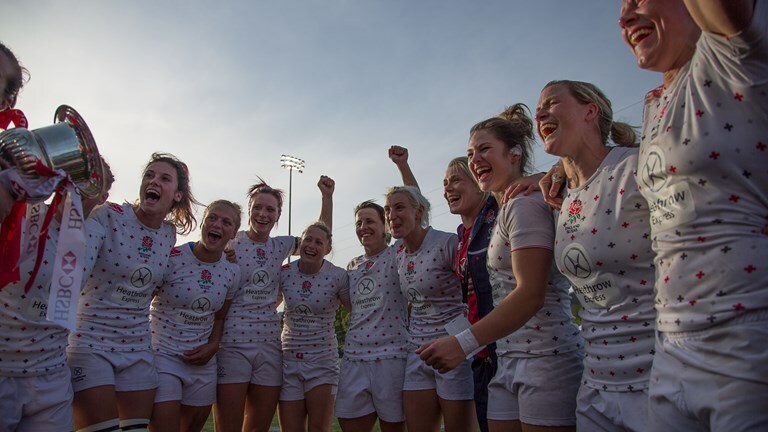 England’s 15-5 semi-final against Australia saw the side cause a major upset in the Series as it was the first time this season that Australia didn't win a round, having claimed top prize in Dubai, Sao Paulo and Atlanta. Captain Emily Scarratt’s breakaway try in the first half was followed up by further touch downs from 20-year-old Abbie Brown and a sprint break from Watmore. England opened the second day with a decisive 29-7 victory of the USA, with Watmore and Danielle Waterman, making her first Series appearance following 13 months on the side lines, both scoring twice. Heading into the final round in Clermont-Ferrand, France on 28-29 May, England remain third in the overall Series standings, but now sit just four points behind New Zealand’s 64, with Australia well ahead on 76. For the full Series standings, click here.